One of the first things many of our customers like to know is the proximity of their villa to local beaches. Obviously the answer to this will differ depending on where your villa is located. For example, people holidaying West of Chania will be closer to the famous beaches of Elafonisos and Falassarna while those taking a villa in Kokkino Chorio will be happily situated within easy distance of Almyrida, Plaka and Georgioupolis. Why not hire a car and discover all of these wonderful beaches? Irrespective of where you are based, the large majority can all be reached within a two hour drive and many of them by far shorter a journey. A charming, crescent shaped beach with lovely sand and very safe, shallow waters. Ideal for those staying in Almyrida, Kokkino Chorio and Plaka. The beach has excellent amenities with sun beds and parasols for hire as well as a great range of water sports. There is also a wonderful variety of restaurants to choose from serving traditional Cretan cuisine as well as favourites from home. The resort is a popular evening spot for families and couples looking for a delicious meal by the sea and a relaxed atmosphere. Located approximately 20km east of Chania, Kalives is a picturesque fishing village and shares the same stunning backdrop as its neighbouring village of Almyrida - the magnificent White Mountains. Expect crystal clear waters, mouth watering eateries and soft golden sand! Georgioupolis is around 43km east of Chania, so best suited for those taking a villa in the villages of Kokkino Chorio, Almyrida, Kefalas, Kournas and Plaka. This long sandy beach is a real favourite with families and can get rather busy during the peak season. However, this means that amenities are superb with many options for a delicious lunch as well as shops and water sports. Sun beds and parasols can be easily hired on the beach and there is a decent amount of free parking. Located 3km inland from Georgioupolis is the famous Lake Kournas – the only freshwater Lake in Crete! Popular with locals and tourists alike, this stunning natural attraction is a fabulous day trip. 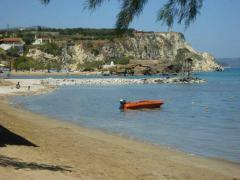 Located in the bay of Souda, on the peninsula of Akrotiri – Marathi is situated approximately 16 km east of Chania City. Because it is protected from the dominant north and west winds it can still be very pleasant in winter and also has superb views from the White Mountains. It can however be quite busy on weekends and in August. Blessed with crystal clear calm waters and stunning views, Marathi is well worth a visit – especially for those holidaying in Chania as the beach is less than a 30 minute drive away. 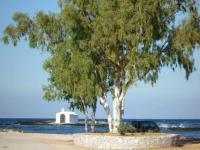 This little gem is located approximately 26km east of Chania - between Paleloni and Kefalas villages. Although you will not find fine sugar white sand here, the rocky beach is a snorkeler’s paradise with idyllic crystal blue water and incredible visibility. There is a small harbour with a dock – and many like to jump into the inviting waters from here! Simos was the ‘secret’ paradise beach of west Crete before it was discovered about 10 years ago. Still well worth a visit though as you will encounter stunning stretches of pure white sand as well as dramatic patches of pink – a remarkable sight. Visitors can wade out to a small island nearby and marvel at the incredible beauty of the surroundings. For those staying east of Chania, Simos beach can be up to a 2 hour drive away but the journey can easily be broken with a lazy taverna lunch and some wonderful sight seeing along the way. What lies at the end of the journey is more than worth it... If staying in one of our villas in Chania then expect to drive around 1 hour and 30 to read this famous beach. Gramvoussa is located at the tip of the westernmost peninsula of Crete, around 45km west of Chania. Expect to find magical turquoise waters, lagoons and beaches of pure white sand. Its discovery by more and more tourists and the improved accessibility (regular boat excursions as well as a good dirt road leading close to the beach) has lead to heightened crowds in the peak season but nevertheless, it remains a stunning sight to behold and gets a regular mention iin articles focusing on the best beaches in Crete. Another splendid beach to be found approximately 58 km west of Chania. The blue and green crystal clear water is backed by pure white sand and majestic dunes. As the beach faces the west, this is a popular spot to watch a memorable Cretan sunset. It is wide and long so usually quite easy to find your own personal spot of sand! Falassarna has good beach facilities and is a must-see for anyone visiting Crete. You can either drive or take advantage of the bus service that runs during the tourist season of April to October. So as you can see, Crete is blessed with a wide variety of beaches as well as its very own freshwater lake. If you have not booked your holiday for this year then why not use the “Check Availability” search on our homepage to quickly pinpoint the villas which still have availability for 2017. You will find plenty of options whether you fancy a week or two in the summer or just a short break out of peak season, where you can take advantage of our low occupancy offers. Should you have any questions regarding Crete or any of our villas, please call us on 0330 111 0061 today and we will be delighted to help! Alternatively, take a look at our About Crete page!